1842: born in Ôsaka. His father Nakamura Seikichi is a theater hair-dresser. 1848: he makes his first appearance on stage at the Kado no Shibai, where he receives the name of Ichikawa Tatsuzô. 1851: he becomes disciple of the actor Ichikawa Kodanji IV, who gives him the name of Ichikawa Koyone I. 1862: Ichikawa Koyone I takes the name of Ichikawa Shôjaku I. 1864: he is adopted by Ichikawa Kodanji IV, who gives him the name of Ichikawa Sadanji I. The two actors go together to Edo. 1865: his adoptive father Ichikawa Kodanji IV dies. 2nd lunar month of 1867: premiere at the Ichimuraza of Kawatake Shinshichi II's new year sogamono "Keisei Soga Kuruwa Kagami", in which was premiered the drama "Oshizu Reiza"; Sadanji plays the roles of Kyô no Jirô, Ushijima Chikara and the uekiya Yanagishima no Matsu [more details]. 3rd lunar month of 1870: premiere at the Moritaza of Kawatake Shinshichi II's drama "Keian Taiheiki". The leading role of Marubashi Chûya is played by Sadanji. 10th lunar month of 1872: Sadanji takes part in the opening ceremony of the Shintomiza. January 1875: premiere at the Shintomiza of Kawatake Shinshichi II's drama "Ôgi Byôshi Ôoka Seidan" (commonly called "Ten'ichibô"); Sadanji played the roles of Yoshida Sangorô and Yamanouchi Iganosuke [casting]. June 1876: premiere at the Shintomiza of Kawatake Shinshichi II's drama "Hototogisu Date no Kikigaki"; Sadanji plays the roles of Asahino Yagorô, Karagi Wasuke and Aranami Kajinosuke [casting]. October 1878: premiere at the Shintomiza of Kawatake Shinshichi II's drama "Jitsugetsusei Kyôwa Seidan"; Sadanji plays the role of the tobi Tsukimi no Bunji [casting]. February 1879: premiere at the Shintomiza of Kawatake Shinshichi II's drama "Ningen Banji Kane no Yo no Naka"; Sadanji played the roles of Sunada Utsuzô and the rice merchant Takayasu Tokushirô [casting]. 16 July 1879: Sadanji takes part in the gala night at the Shintomiza in the honor of the General Ulysses S. Grant [more details]. March 1881: premiere at the Shintomiza of Kawatake Mokuami's masterpiece "Kumo ni Magou Ueno no Hatsuhana"; Sadanji plays the role of Kaneko Ichinojô [casting]. May 1881: premiere at the Saruwakaza of Kawatake Shinshichi II's drama "Ôsakazuki Shusen no Tsuwamono"; Sadanji plays the role of Hara Saisuke, in reality Baba Saburobei [casting]. June 1881: premiere at the Shintomiza of Kawatake Shinshichi II's jidaimono "Youchi Soga Kariba no Akebono" [casting]; Sadanji plays the role of Danzaburô (Gorô's retainer). Premiere in the same theater of Kawatake Shinshichi II's dance-drama "Tsuchi Gumo", which is staged to commemorate the 32nd anniversary (33rd memorial service) of late Onoe Kikugorô III; Sadanji plays the role of Hirai Yasumasa [casting]. November 1881: premiere at the Shintomiza of Kawatake Mokuami's zangirimono drama "Shima Chidori Tsuki no Shiranami"; Sadanji plays the role of Matsushima Senta [casting]. 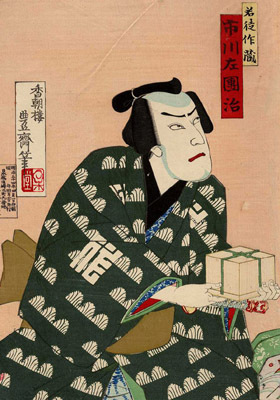 June 1882: premiere at the Saruwakaza of Kawatake Mokuami's Nagauta-based matsubamemono "Imayô Mochizuki" (commonly called "Mochizuki"); Sadanji plays the role of Mochizuki Saemon Akinaga [casting]. January 1883: premiere at the Shintomiza of Kawatake Mokuami's drama "Medeshi Yanagi Midori no Matsumae"; Sadanji plays the role of Yagyû Tajima-no-Kami [casting]. April 1883: premiere at the Shintomiza of Kawatake Mokuami's Nagauta-based matsubamemono "Ibaraki"; Sadanji plays the role of Watanabe Genji Tsuna [casting]. January 1885: two dances are staged at the Chitoseza, about to reopen in February 1885 with a new name. From the 4th to the 7th of January, two auspicious dances and a kôjô with the troupe led by Ichikawa Danjûrô IX are staged. The sanbasô is staged with Sadanji (Okina), Bandô Kakitsu I (Senzai) and Onoe Kikugorô V (Sanbasô). This is also the premiere of the Nagauta-based dance-drama "Tsuru Kame" [more details]. February 1885: Sadanji takes part in the opening ceremony of the Chitoseza [more details]. Premiere at the Chitoseza of Kawatake Mokuami's drama "Suitengû Megumi no Fukagawa"; Sadanji plays the roles of Ogiwara Ryôsaku and the rickshaw Sangorô [casting]. November 1885: premiere at the Shintomiza of Kawatake Mokuami's Nagauta-based matsubamemono "Funa Benkei"; Sadanji plays the role of Benkei [casting]. 26 April 1887: the emperor views Kabuki for the first time at the residence of Inoue Kaoru, the Minister of Foreign Affairs. The casting includes the three leading stars Sadanji, Ichikawa Danjûrô IX and Onoe Kikugorô V.
October 1887: premiere at the Shintomiza of Kawatake Mokuami's matsubamemono "Momijigari"; Sadanji plays the role of Taira no Koremochi [casting]. May 1888: première at the Chitoseza of Kawatake Shinshichi III's drama "Kagotsurube Sato no Eizame"; Sadanji plays the role of Sano Jirôzaemon [casting]. March 1890: premiere at the Kiriza of Takeshiba Kisui's drama "Kami no Megumi Wagô no Torikumi"; Sadanji plays the roles of Kitadashi Kisaburô and the sumôtori Kuryûzan Namiemon (previously named Mizuhiki Seigorô) [more details]. July 1890: premiere at the Shintomiza of "Kiyomasa Seichûroku", a revised version of Kawatake Shinshichi III's 1875 drama "Minori no Aki Seishô Denki". It was part of a special 2-day gala program starring Ichikawa Danjûrô IX; Sadanji plays the role of Sakakibara Yasumasa [more details]. October 1890: premiere at the Kabukiza of Kawatake Mokuami's Tokiwazu-based dance-drama "Modoribashi"; Sadanji plays the role of Watanabe Genji Tsuna [casting]. November 1892: Sadanji becomes the zagashira of the Ichimuraza, which is rebuilt in the district of Shitaya. November 1893: opening ceremony of the Meijiza, rebuilt and managed by Sadanji [more details]. October 1898: premiere at the Meijiza of Takeshiba Kisui's dance-drama "Sannin Katawa"; Sadanji plays the role of the crawling cripple [casting]. March 1899: premiere at the Meijiza of the drama "Kurotegumi Kuruwa no Tatehiki", which gathers the main scenes from the sukerokumono part of Kawatake Shinshichi II's 1858 drama "Edo Zakura Kiyomizu Seigen"; Sadanji plays the roles of the bantô Gonkurô and Sukeroku [casting]. May 1904: Sadanji appears on stage for the last time, at the Meijiza, where he plays the role of the fisherman Yatôta in Matsui Shôô's drama "Tekikoku Kôfuku". Ichikawa Sadanji I belonged to the triumvirat of stars who dominated the Kabuki world during the Meiji era (the two others were Ichikawa Danjûrô IX and Onoe Kikugorô V). He was the leading actor of many shinkabuki dramas and worked on scripts written by authors who did not belong to the Kabuki world, like Matsui Shôô, or adapted contemporary popular novels, like Kôda Rohan's "Hige Otoko". His two most successful roles were Marubashi Chûya and Baba Saburobei in "Keian Taiheiki" and "Ôsakazuki".